Final Spots Open on GRS NYC Marathon Team! Running to give girls a chance! 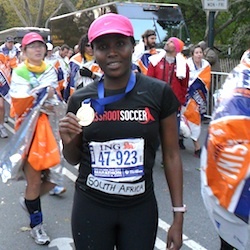 Grassroot Soccer has a few spots left on our 2014 NYC Marathon Team, and we’d love for you to spread the word to your networks and any possible runners. This is an opportunity to run in one of the world’s most prestigious, exciting, and iconic races; thousands of hopefuls enter the lottery for a spot, and many get turned away – but with Team GRS, you not only get into the race, you get to run for something far more than a finisher’s medal! This year our Team is focused on one goal: to engage 6,000 African girls in a unique program that educates and empowers them to live healthy lives, access critical health services, combat gender-based violence, stop the spread of HIV in their communities, and gain self esteem through playing soccer. Only 11% of adolescent girls in southern Africa have the chance to play sport, while 100% of Grassroot Soccer girls are playing soccer and building self esteem in the process. Only 18% of girls in South Africa have ever taken an HIV test, while 70% of Grasroot Soccer girls have. Both BIG improvement and BIGimpacts. That’s why we want to engage another 6,000 girls in this opportunity. First, SERIOUSLY consider joining our team yourself – we have team members coming from far and wide for this chance – including South Africa, India, the UK – as well as from right around the corner in NYC too. We’d love for you to join! Second, REACH OUT to your friends, your family, your colleagues, your workout buddies, your soccer team, and anyone you might think would be interested in this chance. For our part, we promise to support team members every step of the way, with training tips, logistics support, an amazing team dinner, training gear, fundraising help, and more!